As part of our three-step effort to increase communication between the Journal of Technology and Teacher Education and its authors (Chenowith & Ferdig, 2016), we end each year by publishing an editorial that essentially acts as a year-in-review. This editorial examines the work that was published in 2017 within volume 25 of JTATE. In volume 26, issue 2, we will be publishing more quantitative data on acceptance rates, total number of submissions, etc. (see Ferdig & Chenowith, 2017). The purpose of this editorial, however, is to be more qualitative in nature—attempting to synthesize what we learned about the study of technology and teacher education from our author contributions. By summarizing, we are also attempting to describe the trajectory of research in the field of technology and teacher education. As always, we encourage readers to read the details of each article. Chenowith, N.H. & Ferdig, R.E. (2017). Editorial: What we learned about Technology and Teacher Education in 2017. 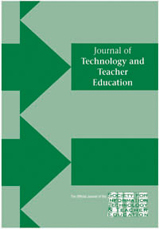 Journal of Technology and Teacher Education, 25 (4), 365-375. Waynesville, NC USA: Society for Information Technology & Teacher Education. Retrieved April 24, 2019 from https://www.learntechlib.org/primary/p/181975/. Accardo, A., & Xin, J. (2017). Using technology-based simulations to promote teacher candidate parental collaboration and reflective instructional decision-making. Journal of Technology and Teacher Education, 25(4), 469493. Amundson, L. (2017). Web 2.0 technologies: The best-fit model for preservice teachers. Journal of Technology and Teacher Education, 25(2), 131-154. Chenowith, N.H., & Ferdig, R.E. (2017). Editorial: What we learned about technology and teacher education in 2016. Journal of Technology and Teacher Education, 24(4), 373-382. Cohen, J.D. (2017). Maker principles and technologies in teacher education: A national survey. Journal of Technology and Teacher Education, 25(1), 5-30. Ellis, J., Polizzi, S.J., Roehrig, G., & Rushton, G. (2017). Teachers as leaders: The impact of teacher leadership supports for beginning teachers in an online induction program. Journal of Technology and Teacher Education, 25(3), 245-272. Ferdig, R.E., & Chenowith, N.H. (2017). Editorial: Submissions and publication data from the 2016 volume of the Journal of Technology and Teacher Education. Journal of Technology and Teacher Education, 25(2), 125-129. Foulger, T.S., Graziano, K.J., Schmidt-Crawford, D.A., & Slykhuis, D.A. (2017). Teacher educator technology competencies. Journal of Technology and Teacher Education, 25(4), 413-448. Gomez, M. & Journell, W. (2017). Professionality, preservice teachers, and Twitter. Journal of Technology and Teacher Education, 25(4), 377-412. Gonczi, A., Maeng, J., & Bell, R. (2017). Elementary teachers’ simulation adoption and inquiry-based use following professional development. Journal of Technology and Teacher Education 25(2), 155-184. Koehler, M.J., Greenhalgh, S.P., Rosenberg, J.M., & Keenan, S.F. (2017). What the tech is going on with teacher’s digital teaching portfolios? Using the TPACK framework to analyze teachers’ technological understandings. Journal of Technology and Teacher Education, 25(1), 31-59. Krutka, D.G., Nowell, S., & Whitlock, A.M. (2017). Towards a social media pedagogy: Successes and shortcomings in educative uses of Twitter with teacher candidates. Journal of Technology and Teacher Education, 25(2), 215-240. Luebeck, J., Roscoe, M., Cobbs, G., Diemert, K., & Scott, L. (2017). Re-envisioning professional learning in mathematics: Teachers’ performance, perceptions, and practices in blended professional development. Journal of Technology and Teacher Education, 25(3), 273-299. McCarthy, A., Maor, D., & McConney, A. (2017). Mobile technology in hospital schools: What are hospital teachers’ professional learning needs? Journal of Technology and Teacher Education, 25(1), 61-89. Mourlam, D. (2017). Preparing for infusion: Emergence of a model for faculty TPACK development. Journal of Technology and Teacher Education, 25(3), 301-325. Schussler, D., Frank, J., Lee, T., & Mahfouz, J. (2017). Using virtual role-play to enhance teacher candidates’ skills in responding to bullying. Journal of Technology and Teacher Education, 25(1), 91-120. Skultety, L., Gonzalez, G., & Vargas, G. (2017). Using technology to support teachers’ lesson modifications during lesson study. Journal of Technology and Teacher Education, 25(2), 185-213. Stapleton, J., Tschida, C., & Cuthrell, K. (2017). Partnering principal and teacher candidates: Exploring a virtual coaching model in teacher education. Journal of Technology and Teacher Education, 25(4), 495-519. Wake, D., Dailey, D., Cotabish, A., & Benson, T. (2017). The effects of virtual coaching on teacher candidates’ perceptions and concerns regarding on-demand corrective feedback. Journal of Technology and Teacher Education, 25(3), 327-357.